It’s amazing how busy a baby can keep you! I haven’t had a moment to answer e-mail or respond to comments. So I’ll say a big thank you to all of you here, and hope to respond to you individually soon. Here is the little one in some handmade goodness we have received. 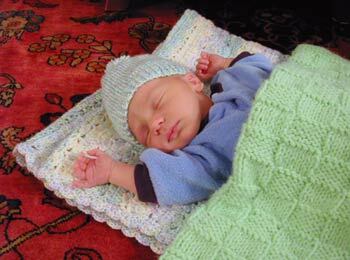 He’s wearing a knit hat from the hospital (one of the local churches makes a hat and blanket for each baby), lying on a crocheted blanket from my sister, and covered with a knit blanket from the Prayer Shawl Ministry at our church. She is adjusting very well to having a new member in the household! Beautiful baby and pretty adorable dog, I bet they will be best of friends in no time. 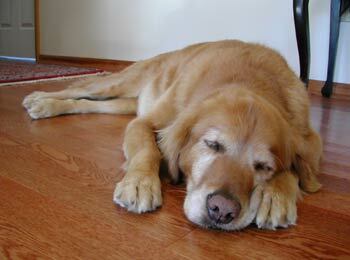 Don’t be surprised if your dog gets very motherly with Miles. OMG I wouldn’t have thought it was possible for him to get cuter but I think he just may have. He’s SO sweet! Congrats again and Merry Christmas. I have been thinking of you a lot. This is such a special Christmas for you. He’s absolutely beautiful-treasure each moment! Yes, they do keep you busy! Merry Christmas! Miles is precious. Oh, beautiful pictures and gorgeous, wonderful baby! When my kids were babies we had the Best Golden Ever. They are the ultimate kid dog. She’ll be your backup babysitter, Miles will never get out of her sight and she will love him because you do. Miles is just adorable in all the homemade luxuries, but the doggie is just adorable too! Terribly precious. What a wonderful present for you both. Little Cherry Tomato! I just read over at Crochetville that you had your son! Your first baby! How exciting! (I remember our first baby – there’s nothing like it!) He’s a cutey-pie, too! Congratulations! Enjoy him! how adorable the baby is..love all his homemade goodies, they are so cute..
What a beautiful baby! Babies and handmade items just go together! And the doggie pic is just too cute! Oooh…he’s handsome :) Great gifts! And you have a cutie dog. Hope your year will be very happy! what a cutie, and I love the name!!! babies are so much fun, even on little sleep. Miles is a cute little angel!